This is heavy, Doc. Hundreds of Marty McFlys line up to get their hands on limited edition commemorative bottles. 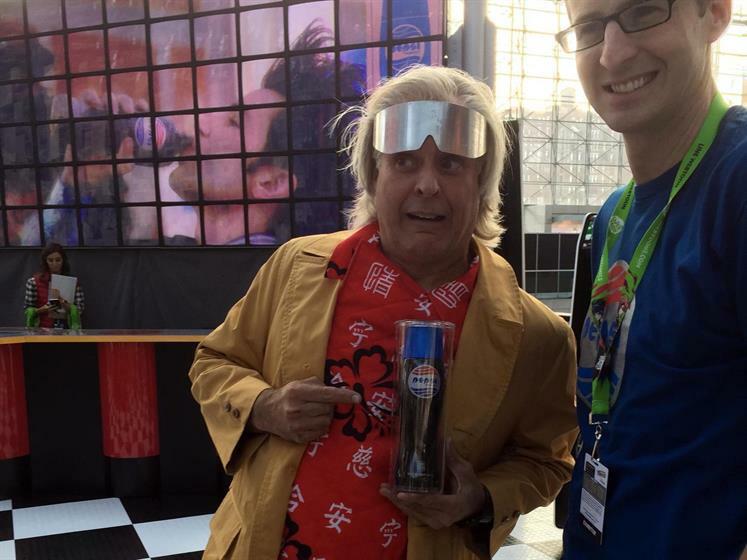 NEW YORK — "Back to the Future II" fans have finally gotten their chance to taste Pepsi Perfect, a 26-year-old concept that was two years in the making. Judging from their reaction, it was worth the wait. "I found out Pepsi was doing a special promotion with Pepsi Perfect, and I just knew I had to line up," said one Comic Con attendee dressed as Marty McFly, the Michael J. Fox character from the film. On Oct 21, the then-futuristic date in which the 1989 sequel largely took place, Pepsi will make just 6,500 bottles of the soft drink available for purchase online — somewhere. So far, Pepsi hasn't revealed the URL. But several hundred truly obsessed fans got their hands on one of the 16.9 oz. 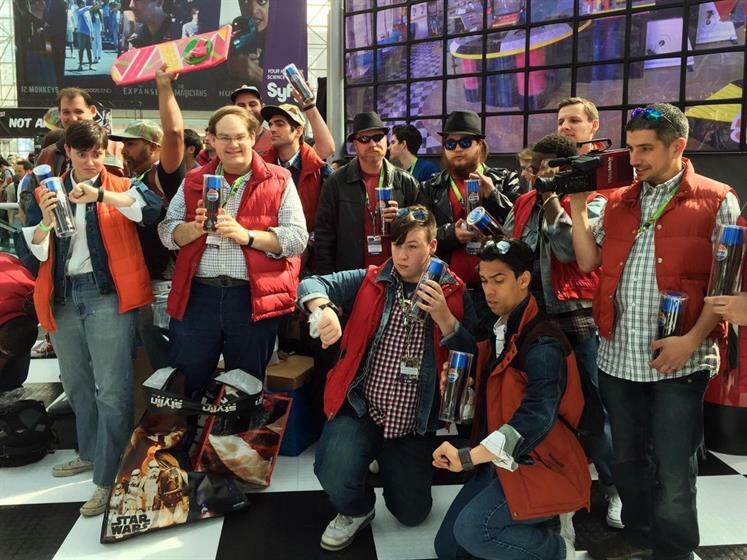 bottles on Thursday by showing up to New York Comic Con dressed as McFly. 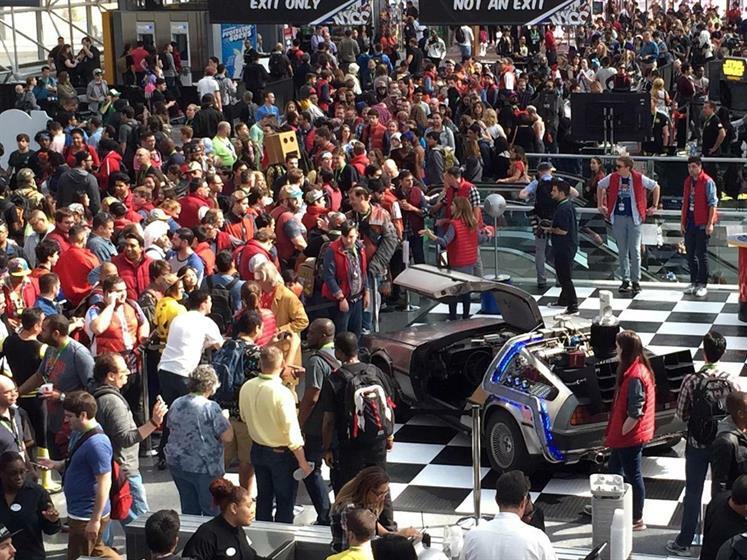 "We decided it was a great way to commemorate the moment," said Angela Tucciarone, a spokeswoman for PepsiCo who was on-hand to oversee the Comic Con giveaway. Pepsi has taken a grassroots approach to promoting the novelty drink. Last week, a photo of the bottle quietly appeared on the films’ Wikipedia page. On Monday, the company released a 35-second spot online that featured several references to the film, including a marquee bearing the title "Jaws 19" and a hoverboard. That same day, the company announced it would give free bottles to the first 200 Marty McFlys in line at Comic Con. Pepsi decided to produce the drink (which tastes like the real-sugar Pepsi released last year, the company says) in response to fan requests. The company collaborated with Universal Pictures, which released the three "Back to the Future" films from 1985 to 1990, to make Pepsi Perfect a reality. The brand was briefly mentioned and shown in the second movie, when McFly travels from his present, 1985, to the year 2015. Most of the promotion for the drink has been through online media — especially Pepsi’s social channels. It's there that the company will eventually reveal the Web address where the bottles will be sold. "We’re going to be sharing that on social media in the next couple of weeks," said Linda Lagos, brand director, "so follow on Twitter and Instagram, and you’ll be able to take a look." So far, the effort has earned Pepsi a surge of engagement on social media, Lagos said. "I checked in with our social media team a couple of days ago," she said, "and we were already getting a huge amount of mentions on Twitter, posts on Instagram. Our campaign has exceeded all of our expectations." While most of the promotion for the Pepsi Perfect will be online, there has been a scattering of print promotion across the United States, as well. "We have a print campaign that’s out in the market now, there are some wild posts we’ve peppered across [New York City], and a few other markets like Venice Beach, just to continue to delight fans," Lagos said. "And that’s going to be out there for a couple of more weeks." Lagos would not say whether more Pepsi Perfect bottles might be available for purchase if demand remianed high after the commemorative 6,500 available sold out on Oct. 21. In keeping with the topical theme, the bottles will sell for $20.15 each.